Inteq, a software services company with its acknowledged focus on the tenets of quality, partners clients in their eternal quest for absolute customer satisfaction. Backed by its ISO 9001 processes, Inteq is committed to helping customers build and validate all high quality software through its focus on software testing. Inteq has proven processes and methodologies that are optimized for software testing and quality assurance functions. 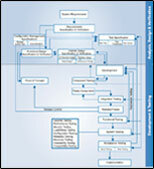 Modeled on a flexible testing life cycle Inteq presents clients a classical and adaptive approach in testing varied applications at any stage of the development life cycle.